For quick and easy mounting Electronic Assembly offers the world's first OLED display family with connector pins in 2.54mm pitch. These features, together with an extended temperature range (-40 to +80°C) and a long service life (at least 50,0000h, up to 100,000h are possible), make them particularly suitable for mounting in mobile handheld devices for robust outdoor use. The devices can be controlled via both an SPI and an I2C interface. EA OLEDL128-6 provides a graphics display resolution of 128 x 64 pixels. It is about 68 millimeters wide and almost 48 millimeters high. The proportion of the active display area amounts to approximately 62 percent. The display is available in three different versions: As robust version OLEDL1286GGA with protective glass and an integrated polarizer for deep background black. As slim version OLEDL1286LGA (yellow) or OLEDL1286LWA (white) without protective glass but with a component height of only 2.4 millimetres. And as elegant designer version OLEDL1286NGA without polarizer for mounting behind a smoked glass pane, for example. This display version features a shiny silver background and is even brighter. EA OLEDM128-6 is slightly smaller (55mm x 43mm) while offering the same resolution. It is available in the versions "Allround" OLEDM1286GGA and "Flat" with yellow OLEDM1286LGA or white OLEDM1286LWA. 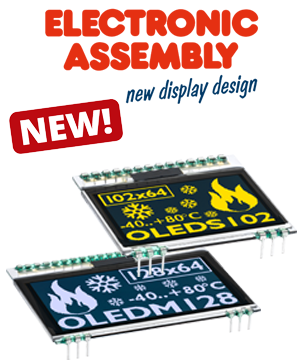 The display unit EA OLEDS102-6 offers a resolution of 102 x 64 pixels (39mm x 38mm). It is available in the versions "Allround" OLEDS1026GGA and "Flat" OLEDS1026LGA. EA OLEDM204 is a text display with either 4 x 20 characters or 3 x 20 characters as well as 2 x 20 characters in double font size. This display measures 61 mm x 26 mm and is also available in the versions "Allround" OLEDM204GGA and "Flat" OLEDM204LGA. In addition to the display in the standard colours yellow or white on black, special designs with green or blue are also possible for orders of a minimum quantity of 10,000 pieces. Please send your request to our sales team!